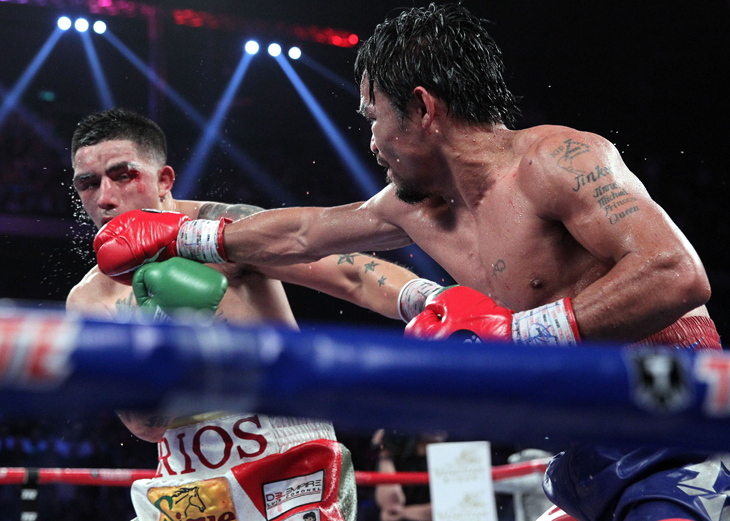 Manny Pacquiao's trip to China to fight Brandon Rios on Nov. 23 in Macau was a success on many levels, but not on the pay-per-view front. Mark Taffet, the senior vice president of HBO Sports, told Yahoo Sports on Thursday the Nov. 23 bout sold 475,000 pay-per-view units and generated roughly $30 million in revenue. Promoters knew going in that fighting outside of the U.S. would adversely impact the pay-per-view numbers, but they weren't sure how much. In a February interview with Yahoo Sports to announce the signing of two-time Olympic gold medalist Zou Shiming, Arum estimated it could be as much as 50 percent. Taffet feared the decline might even be greater. He said his research indicated that a pay-per-view emanating from outside the U.S. would only get 30 to 40 percent as much as a show started from within the U.S., despite the fact that the show started at the exact same time as it would have had it been in the U.S.
"So we knew there were challenges and tempered our expectations from the beginning," Taffet said. "It was an extraordinary effort by everyone involved, and we recognized that anything above 350,000 buys would be a success. "Our efforts in establishing a U.S. media center and originating radio, television and print interviews with legends George Foreman, Ray Leonard, Roberto Duran, Ray Mancini and Marco Antonio Barrera went a long way toward helping us address some of the challenges and reach the levels that we did." Pacquiao's knockout loss at the hands of Juan Manuel Marquez in 2012 probably had some impact upon the number, as well. Regardless, it's time for Top Rank to do everything it can to facilitate a fight between Pacquiao and Floyd Mayweather. 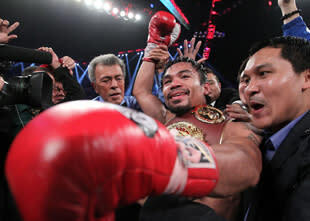 For some reason, Top Rank's Bob Arum is insistent that Pacquiao will fight on April 12, 2014, in Las Vegas at the MGM Grand instead of reaching out to the Mayweather camp in the hope of making a bout on May 3, 2014. That didn't sit well with Golden Boy's Richard Schaefer, who has promoted all of Mayweather's fights since 2007. Schaefer and Arum are never going to see eye-to-ey, and they frequently look like fools by bashing each other publicly. But there is so much money at stake in the bout and the fans so desperately want to see the fight that it is worth every effort to make it happen. It remains highly unlikely -- Expect Mayweather to fight Amir Khan in May -- but it's incumbent upon the sides to at least explore the possibility. Arum and Top Rank president Todd duBoef should be doing all they can to make a Mayweather-Pacquiao fight, and they're not doing that by announcing a date for the Filipino star this early. Neither Mayweather nor Pacquiao have particularly attractive opponents available for the spring. A bout between them would sell far more pay-per-views and generate far more money than against anyone else individually. Pacquiao has lost a lot of leverage after his losses to Timothy Bradley and Marquez and the pay-per-view numbers he did for the Rios fight. Adding the pay-per-view sales (475,000) and the viewers the bout did on a replay on HBO (slightly over 1 million), the Pacquiao-Rios fight still came in at nearly 800,000 fewer viewers than Mayweather did in pay-per-view sales alone for his Sept. 14 bout with Canelo Alvarez. That set a boxing revenue record with $150 million in sales. The bout came in as the No. 2 bout all-time in terms of pay-per-view sales, at 2.2 million.